Most of us know trees can beautify a yard, attract desirable wildlife, and provide privacy from neighbors. What homeowners may not realize, however, is that trees can also play an important role in helping reduce home energy costs. Trees absorb carbon dioxide (CO2) and other polluting particulates in the air, and through photosynthesis, they store the carbon and emit pure oxygen. In addition to producing the oxygen we breathe and keeping the air clean, having plenty of shade tree landscaping in your yard can help reduce your energy bill by allowing you to save on air conditioning. The Arbor Day Foundation is a nonprofit that plants trees and educates people around the world about the ways in which trees improve our climate and environment. It offers a ton of information about how trees for shade, in particular, play a role in the environment. Here are just some of the many ways in which shade tree landscaping can help home energy conservation and the planet at large. The net cooling effect of a young, healthy tree is equivalent to 10 room-sized air conditioners that operate 20 hours a day. If you plant a tall shade tree today on the west side of your home, your energy bills should be 3% less in five years. In 15 years, the savings will be nearly 12%. One acre of forest absorbs six tons of carbon dioxide and puts out four tons of oxygen. This is enough to meet the annual need of 18 people. There are about 60-200 million spaces along America’s city streets where trees could be planted. This translates to the potential to absorb 33 million more tons of CO2 every year and save $4 billion in energy costs. Trees properly placed around a building can reduce air conditioning costs by 30% and can save 20-50% in the energy used for heating. Planting trees means improved water quality, which results in less runoff and erosion. This allows more recharging of the groundwater supply. Wooded areas help prevent the transport of sediment and chemicals into streams. Deciduous trees planted on the right sides of your property can help keep your house cool in the summer for a lower air conditioning bill. They also let the sun offer passive warmth in the winter, which helps for reducing energy bill costs for heat. Just three trees, properly placed around a house, can reduce energy use by up to 30%. There’s even shade landscaping for air conditioners. When protected by tall shade trees or shrubs, the units will cool buildings more efficiently and use less electricity, which translates to being able to save on air conditioning. Neighborhoods with well-shaded streets can be up to 6-10°F cooler than neighborhoods without good trees for shade. In one study, 83% of realtors believed that mature trees have a ‘strong or moderate impact’ on the marketability of homes listed for under $150,000; on homes of over $250,000, this perception increases to 98%. Landscaping, especially with trees, can increase property values by as much as 20%. Healthy, mature trees add an average of 10 percent to a property’s value. Nationally, the 60 million street trees have an average value of $525 per tree. Plant good trees for shade by your air conditioner to help keep it cooler and therefore save on air conditioning costs. A unit operating in the shade uses as much as 10% less electricity than one operating in the sun, according to the U.S. Department of Energy. 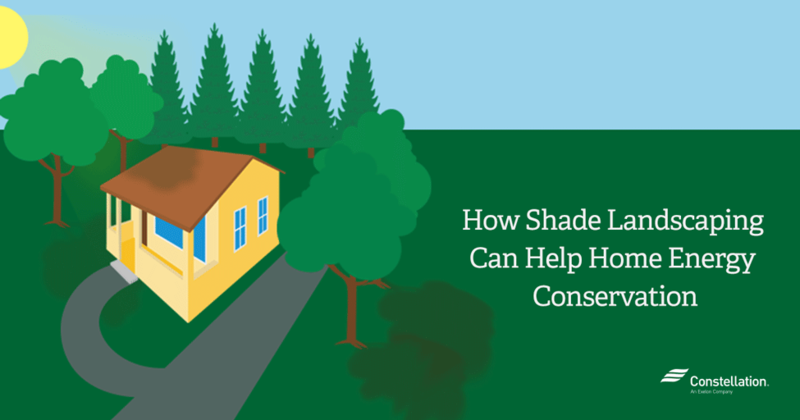 Consider using trees for shade by patios, sidewalks and driveways. Doing this can cool the concrete, the entire yard and even the neighborhood. Planting large deciduous trees for shade on the east, west and northwest sides of your home can create shade from the hot summer sun and reduce air conditioning costs by up to 35%. The Arbor Day Foundation offers these shade landscaping tips to help reduce energy costs in the colder months. Plant a row of conifer trees on the north and northwest sides of your property to create a wall against cold winter winds. This can reduce your energy bill by up to 30% for heating costs. The most snow accumulates at the downwind side of trees, so plant your windbreak a one or two tree-height distance from your rooftop and driveway for the most effective home energy conservation. The sun is lower on the southern horizon in the winter. Avoid planting evergreen trees on the south side of your home so they don’t block winter sun. Not all trees are created equal when it comes to shade tree landscaping. Some grow more quickly than others. There is no point picking tall shade trees to help reduce your energy bill if it’s going to take 40 years for them to reach the height you need to achieve savings. Choosing the right height tree for what you want to accomplish also matters to possibly reduce air conditioning costs or offer solid winter windbreak to help reduce your energy bill. If you’re not sure where to begin, the Arbor Day Foundation has something it calls the Tree Wizard. By typing in your ZIP code and selecting various categories — tree type, such as evergreen or fruit tree, growth heights and speed of growth — the wizard offers the best tree options for your area. The foundation also sells trees and ships for free. Bottom line? The trees in your yard are more than just your own piece of Mother Nature. They can also play an integral role in how you manage energy costs, too. Thanks a ton for the great article. The section on shade trees gave me a lot to think about to help with the energy around the house. Hi Kelvin, that’s great to hear! We’re happy to have helped.